Luke Shaw's Manchester United and England prospects looked bleak at the end of last season but it has all changed now. Nick Wright assesses his return to form as Gareth Southgate's side prepare for the UEFA Nations League meeting with Spain, live on Sky Sports on Saturday. Midway through last season it seemed Luke Shaw had finally won over Jose Mourinho and become Manchester United's first-choice left-back. It was January and the 23-year-old had just started five consecutive games for the first time since breaking his leg in 2015. "I don't see many left-backs better than this Luke Shaw," said Mourinho at the time. The United manager was speaking after Shaw impressed in a 3-0 win over Stoke, but a few days later he was back on the bench when Ashley Young returned from suspension. Shaw lost his place and his momentum went with it. In March, he was hauled off halfway through an FA Cup tie against Brighton. Two months later, he was not even in the squad for the final. By that point, Shaw, so often the subject of scathing criticism from Mourinho in the past, knew he would not be going to the World Cup with England. Gareth Southgate had been clear in his insistence that players who were not playing for their clubs would not be called on. Danny Rose was an exception to the rule. Shaw was not. It was a bitter blow for someone widely expected to take over from Ashley Cole when he became the youngest player to feature at the 2014 World Cup, but his fall from grace has been such that it did not come as a surprise. Shaw admits he struggled with the step up from Southampton to United. Mourinho's abrasive style has not been easy, either. It is only now that things finally seem to be coming together. 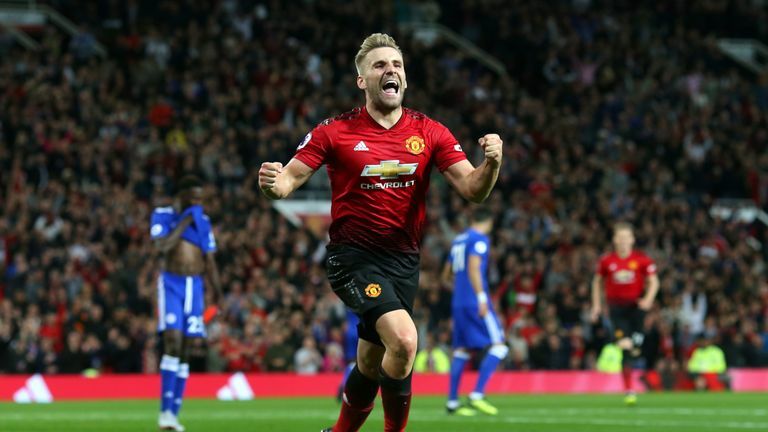 Shaw has not missed a minute for Manchester United this season, impressing in difficult circumstances and scoring his first senior goal on the opening day against Leicester, and his return to the England fold gives him the opportunity to transfer his club form to the international stage. Mentally, physically, he is stronger. Tactically, he has a better understanding. We are very happy for him. It is extraordinary for him. History suggests we should be wary of another false dawn, but there are reasons to believe that this time it could be different. Mourinho certainly seems convinced. He made a show of praising Shaw on the pitch after United's 3-0 defeat by Tottenham last Monday, and hailed his transformation into a "proper football player" after the 2-0 win over Burnley at the weekend. "In this moment, he is feeling the good results of the hard work of many people that work against him and try to make him a proper football player, because a proper football player is a player of consistency," he said. "Mentally, physically, he is stronger. Tactically, he has a better understanding. We are very happy for him. It is extraordinary for him." Mourinho was eager to credit his staff for the transformation, but Shaw deserves considerable credit himself. After such a disappointing end to last season, and after his confidence took another hit when a photograph of him on holiday in Dubai prompted taunts about his weight and body shape, he could easily have spent the summer feeling sorry for himself. Instead, though, he returned to pre-season training early and vowed to get into the best shape of his career. "I've changed a lot," he said during United's tour of the United States in July. "I'm much fitter, more confident, and a different person than I was last season. I've grown and learned a lot from the situations I've been in." Shaw has matured and the rewards of his hard work can now be seen out on the pitch, where he is bombing up and down United's left flank with increased energy. According to Premier League tracking data, he clocked a higher top speed than anyone else against Brighton and Burnley. He ranks second at United for distance covered this season and first for sprints. It has not gone unnoticed by Southgate. "I am really impressed with the physical condition that he looks in," said the England boss recently. "He had an extra edge to his game in the last couple of matches. I have seen when games have been going against his team, he is one who has shown an aggression to his play and a desire not to lose. "He looks like he is playing with confidence. He is looking back to his powerful best, going past people, which we feel is something that he can add to what we had in the team in the summer. He can bring that extra penetration in wide areas." Suddenly, the outlook has changed completely for Shaw. It was Young who took his place in the United team in January and it was Young who impressed in his absence for England at the World Cup, but a few months on and it's now Young who has not even made Southgate's squad. It is another indication that Shaw's time might finally have come.